African daisies, also known as cape marigold, are annual flowering plants native to the arid regions of southern Africa. They are grown most commonly as ornamental garden plants and produce numerous showy, colorful blooms in early summer through fall. The large flowers close at night and during bad weather but shine in full sun. Flower colors include white, yellow, orange, red, pink and violet. 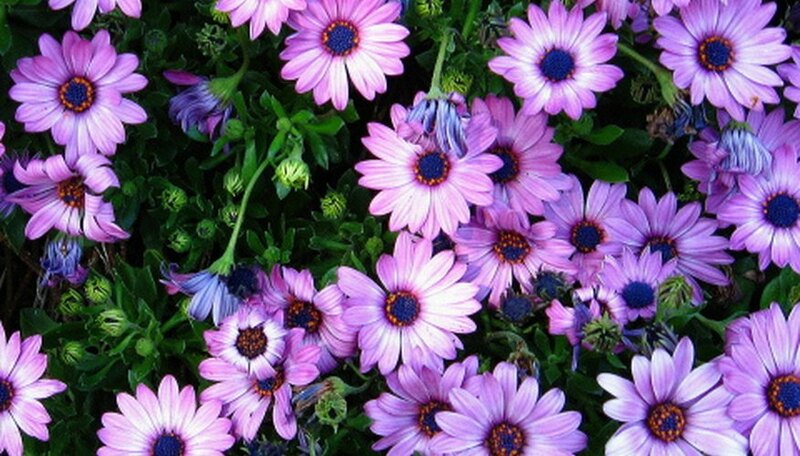 The African daisy is very easy to grow and requires very little maintenance after planting. Sow African daisy seeds in the garden about one week before the last frost in your area. Seeds may also be started indoors about 8 weeks before the last frost for earlier flowers. Choose a site with well-drained, fertile soil and full sun exposure for the best results. Break the surface of the soil with a rake, and then work in a thin layer of organic compost prior to planting. Mix the seeds with sand to promote even distribution, and then broadcast them over the prepared area. Water the soil immediately after planting the African daisies, and continue watering once every 2 or 3 days until the seeds germinate. Water once per week after germination occurs until the plants die back in the winter. Be careful not to over water, as this can cause the plants to collapse. Remove flower heads as soon as they begin to fade to prevent reseeding. African daisy can be invasive in warmer climates if not controlled, although they self-seed only moderately in cooler climates. Cut the flowers often to keep the daisies blooming throughout summer and fall. African daisies are tolerant of poor soil, but you'll get more blooms if they're planted in rich soil. African daisy does not require supplemental fertilizer. Just make sure to properly amend the soil with compost prior to planting for better blooms. Sow African daisies in fall in frost-free climates for winter blooms.